Did you know that women are the backbone of agriculture and the key driver of food production around the world? Worldwide, 36 percent of the world’s farmers are women—compared with 34 percent for men. In developing regions, the figure is much higher. In Sub-Saharan Africa and South Asia, 60 to 70 percent of farmers are women. There are 650 million smallholder farmers in the world, and 50 to 80 percent of them are women! They grow 70 percent of the food that is eaten every day and have the potential to feed the world. Despite these impressive numbers, women still face significant disparity in the resources and support they can access, including land, credit and education. This is unacceptable to Heifer. Gender equity is a basic human right and an important component of international development work. By gender equity, I mean that women and men, girls and boys are valued equally and enjoy the same opportunities to achieve their full potential. When gender equity is present, there is accountability, efficiency and sustainability. At Heifer, we know what women can accomplish, and we recognize the value of empowering them. We ensure that gender equity is present in all of our projects – it’s one of our 12 Cornerstones. For Heifer International, development is not just about offering the opportunity of a livelihood and access to basic social services; it is about creating an environment where people can realize their rights, achieve self-reliance and participate meaningfully in society. Heifer International supports the Half the Sky Movement, which is putting an end to the oppression of women and girls worldwide. We encourage you to watch Half the Sky: Turning Oppression into Opportunity for Women Worldwide, a series on PBS October 1 and 2 (9pm Eastern) and join in our shared pledge to helping women and girls succeed so they can achieve their dreams of hope, happiness, opportunity and prosperity. 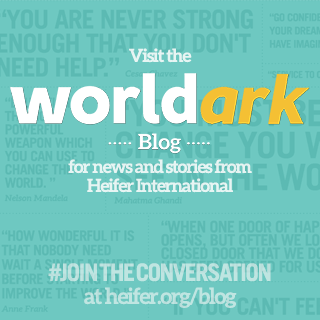 Read more about women's empowerment from Heifer's CEO and guest blogger Susan Saradon. 0 Response to "Women's Empowerment is Key to Turning Oppression into Opportunity"